Rowan and her stick. We have several sticks that are sections of grey, heavy-duty PVC electrical conduit. The black stripes are electrical tape, for contrast, but aren’t really necessary. These have lasted for years (at least five) and don’t result in the kinds of splinters on the house and chunks of wood in the lawnmower that ordinary sticks cause. I’m not sure what to make of this weekend. This is the second day in a row that has called for drizzle, fog, rain and general misery and it’s also the second day of lovely, warm sunshine. 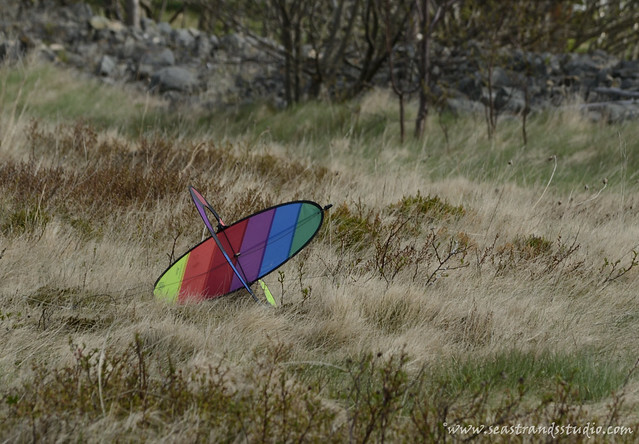 Katherine decided to try out her Prism Flip Kite, bought in Vancouver, for the first time. Then you release it into the air and the ovoid centre piece rotates and creates an effect that causes the kite to lift. It’s a fairly windy day out here, so we had ample fuel for it. Unfortunately, every time it lifted into the air, it rotated a few times and then flattened out and dropped to the round. Very frustrating. I grabbed some electrical tape and permanently fixed the joints such that the kite could not flatten and it was able to stay in the air for a while, although not for as long as I had hoped. Of course, now it also doesn’t flatten for storage, but at least it flew. I’ll try. I did wonder about a tail, but since the kite uses some weird and wild principle called the “Magnus Effect“, I’m not sure what a tail might do. Can’t hurt to try, though! 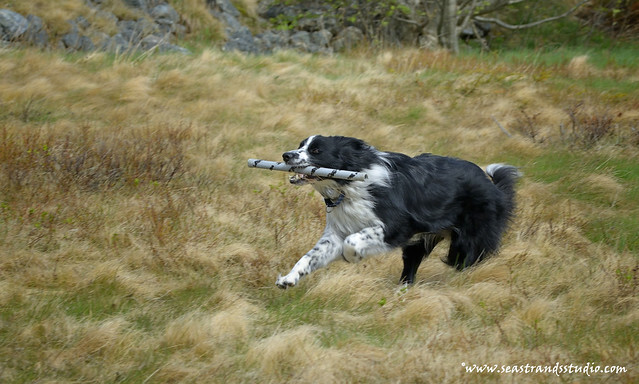 Smudge is banned from sticks of any kind. She is so fast that she arrives as they hit the ground and she can get them stuck in her throat as they bounce back at her. Tennis balls only now! Wow, that’s not only fast, but excellent judgement on her part! Rowan has similar tendencies, but I’ve been working on my throwing arm and ability to fake her out and so far, we’re still able to stick with sticks. Which is good, because she kills tennis balls almost instantly and I think I’d be broke if we had to switch! You might also want to check the bridle. If it’s too short or long or uneven it won’t allow it to rotate properly. I was working all day but I really wanted to be out flying a kite today too! The bridle seems okay. It’s really long, so I can’t see making it longer. I will try shortening it and see what effect that might have. Thanks! The sot of Rowan is fabulous. Looks like a hyper-realist nature painting.